DESOTO—It has been an eventful two days at DeSoto High School for students and administrators. Early Wednesday afternoon, a student injured herself by jumping from a bridge leading to the newly added career facilities. 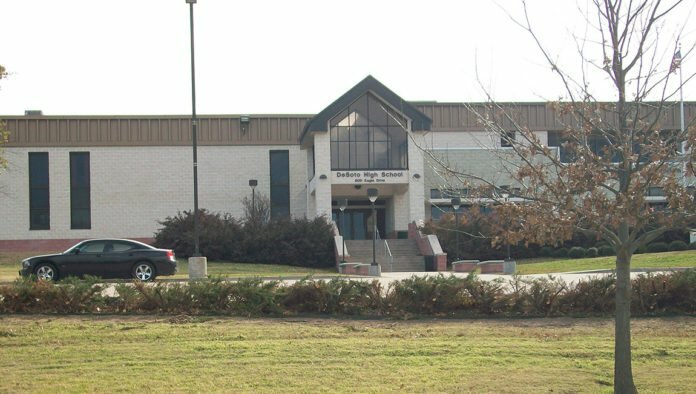 While some student witnesses are calling it an apparent suicide attempt, Principal Shon Joseph described the incident as an attempt at self harm. “We care deeply for each student in our school community and want to ensure that we are doing everything that we can to address the social and emotional needs of our students. Teens are often in the process of understanding themselves and the world around them and may experience feelings and emotions that are beyond their ability to resolve or comprehend,” he said in a letter sent home to parents Wednesday. Due to the student’s age, identification, mitigating factors, etc are being withheld. The student was transported to a nearby hospital for assistance and sustained minimal injury. No weapons were involved and this was an isolated incident involving one student. Joseph did note that an emotional wellness meeting will be held on campus next week to assist students coping with stress during these difficult times. There were incidents of online bullying surrounding this incident. According, to reports some students took pictures of the victim as she was awaiting medical assistance and memes have been circulating on social media in poor taste. Additionally, the district has a bullying reporting tool located on the DeSoto ISD Smartphone application. Parents and students can also click on the “Stay Alert” button on the bottom of www.desotoisd.org to report such concerns. According to reports there was an online threat levied against the high school Thursday morning via Twitter. District administrators note they were able to quickly identify the alleged person who issued the online threat. And the person that actually sent the threat set this student to take the blame. Apparently during testing time there is an uptake in the number of fake threats against the school and/or students. Furthermore, today’s events are in no way related to Wednesday’s incident. This morning, heightened security measures were in place to proactively address any concerns related to this matter. In addition, no weapons were located and no immediate presence of a threat was ever apparent. However, as an added precaution following today’s events, there will be increased security visibility at DHS. Finally, students and staff are reminded that if you see something, say something.